Do you have a friend or family member that you work with in the kitchen that helps you create fun, delicious recipes? Maybe it’s someone that’s a friend that inspires you when you talk with them and then you create a recipe from their ideas? For me, my face to face experience happened back in December of last year when I learned from a co-worker who said “if you want the perfect hard-boiled egg to peel easily, use an old (not expired) egg and once you boil it, the shell comes off easily”. What? I have known you for how many years and you know a little bit about cooking? At that moment I was inspired, so I dug in to get more information. I found out my co-worker who is an engineer, told me that he debated between culinary school or engineering. He chose engineering. I didn’t know he had a passion for cooking and I didn’t realize that he knew a bunch of fun tricks in the kitchen. At that moment we started to talk about cooking and baking and now we have a foodie friendship. When he found out that I was interested in cooking just as he was, we started to bring in treats that we made. One of the first things I tried was his chipotle corn chowder, amazing tasting. it was spicy and, thick and hearty. I asked him what is in this? He told me corn, mushrooms, spicy peppers and chicken. I didn’t get the recipe, measurements or even all of the ingredients, but I took what he told me and tried it at home. 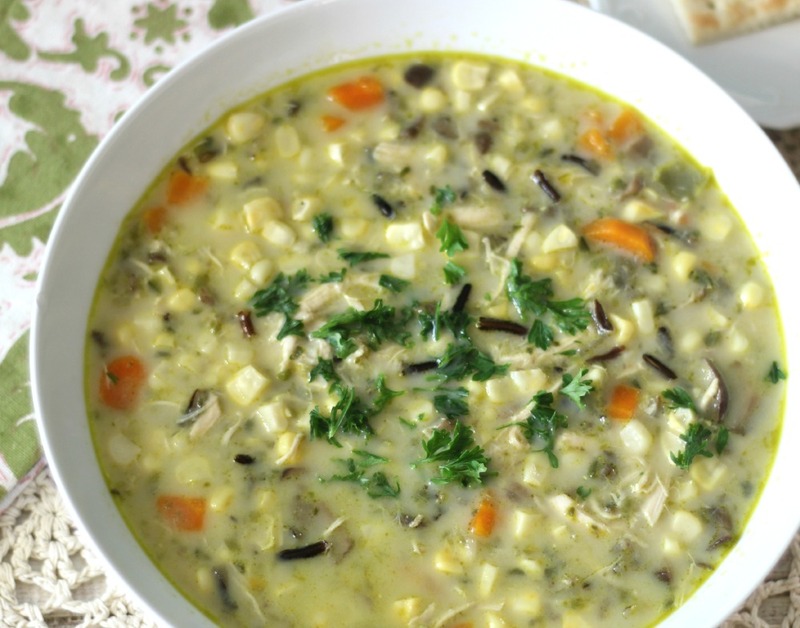 That is when I came up with my Corn Chowder with Wild Rice recipe. It wasn’t exactly the same recipe, but it tasted amazing. Then one day we got on the subject of mushrooms. If you read my blog, you will notice not too many recipes have mushrooms. I don’t like mushrooms, blah! But he told me because you’re using the wrong mushrooms. Wrong mushrooms? Mushrooms are mushrooms to me. But he said try portabella mushrooms, stay away from button mushrooms. He said sauté them once, then sauté them again with wine and chicken stock, trust me you will like them. I figured, fine, I’ll give that a try. I’m always willing to try something at least once. So I tried cooking mushrooms the way he told me too. I took a tester bite and oh my gosh amazing. I was shocked, that I actually like them. 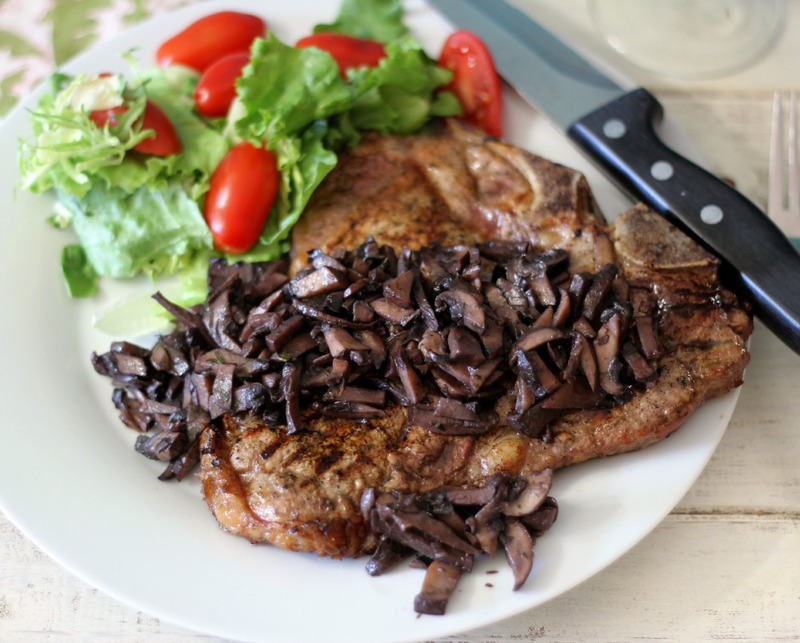 I learned something new and I came up with this amazing recipe for Mushroom Reduction Sauce with T-Bone Steak. Now I use mushrooms all of the time. When cooking in the kitchen, you don’t always have to have someone working side by side with you, but you can have someone who is a phone call or text away. One of the things we do is combine meals together. What we do is come up with an idea, normally a random talk and say ohhhh, I bet that would be good. You know we talk mostly about food. 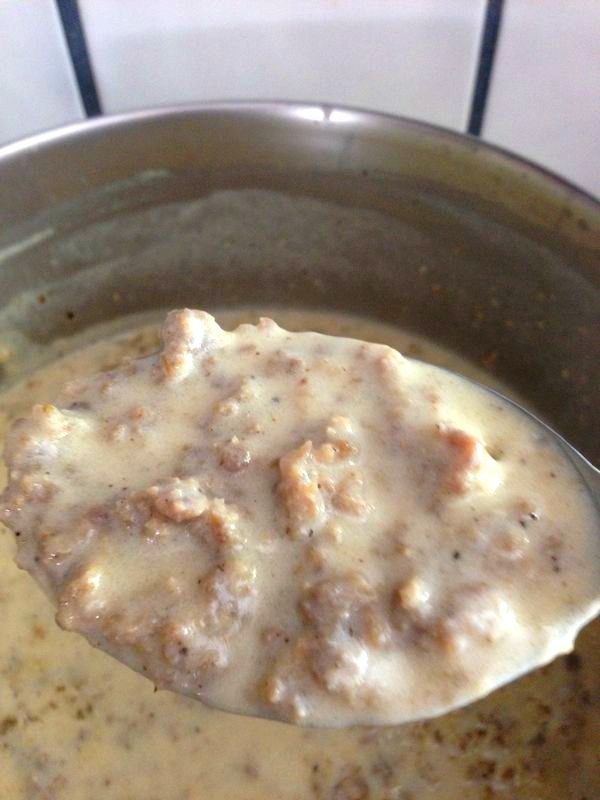 lol One day I made my Southern Style Biscuits and he made Sausage Gravy. We decided we would treat the office to a little southern cuisine for a Monday morning breakfast. I brought in my biscuits and he brought in his gravy. We heated it up in the microwave and even though we didn’t cook it together, we shared it together as one meal for our co-workers. During the day I sent a picture of my biscuits and said my part is done. He shot back a picture and said his gravy is almost done, but he lightened up the peppers in it to appeal to everyone. This is one recipe he hasn’t shared with me, and he knows I’m a calorie counter so he didn’t tell me what was in it. My guess is cream, but it tasted out of this world! Kind of reminded me of something grandma would make. The Biscuits and Gravy filled us up the whole day. Here is the picture he sent me for the gravy. I love that I have someone who I can share my recipes with. Now he doesn’t always like what I make or he maybe a little too honest about it, and as much as I don’t like to be criticized, I do like to learn and try to make my recipes better. It’s kind of scary, saying I made this, what do you think? I know I will get an honest opinion, where some people will tell you it’s good, even when it’s not. 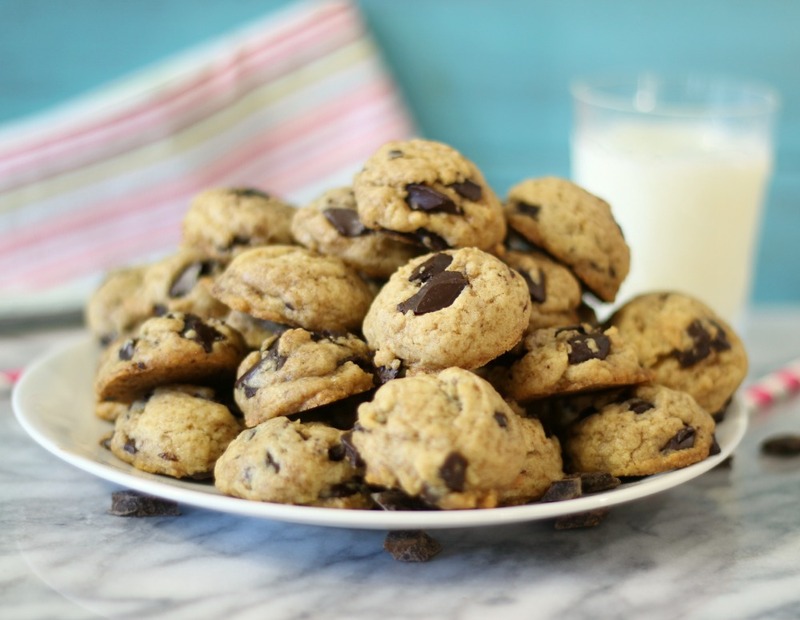 That happened with my Coconut Oil Chocolate Chip Cookies. I gave him a cookie to try and he took a bite, gave me a funny look and said wow, these are really good. I told him, I didn’t use butter, but used coconut oil instead. He was shocked at how buttery the cookies are and was amazed that they didn’t even contain butter. That was a proud moment for me and I think for him, he realized butter doesn’t have to go in everything. Though, my guess is he wouldn’t admit to that. Another recipe that I have made that I have to admit is not my idea, but it is my Pink Moscato Infused Strawberry Shortcake. I had to create a recipe using Pink Moscato. I had no clue what to make? Then he mentioned strawberry shortcake. Oh yeah! Strawberry Shortcake is one of my top 3 favorite desserts. So I took his idea and ran with it. 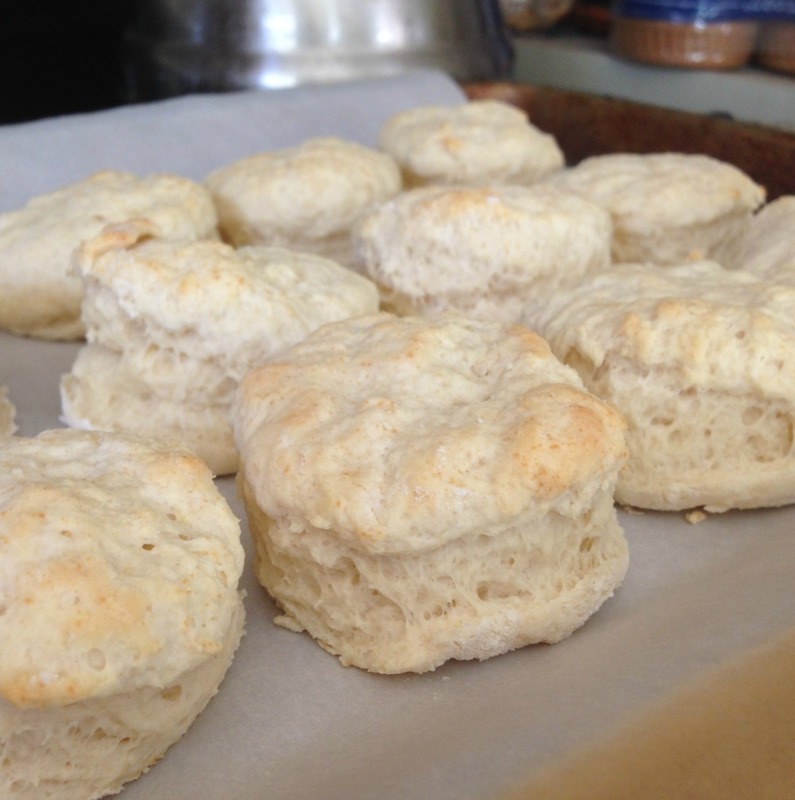 I made for the first time drop biscuits, which was easy and fun. Then I sautéed my strawberries in wine until they were plump, tender and sweet. 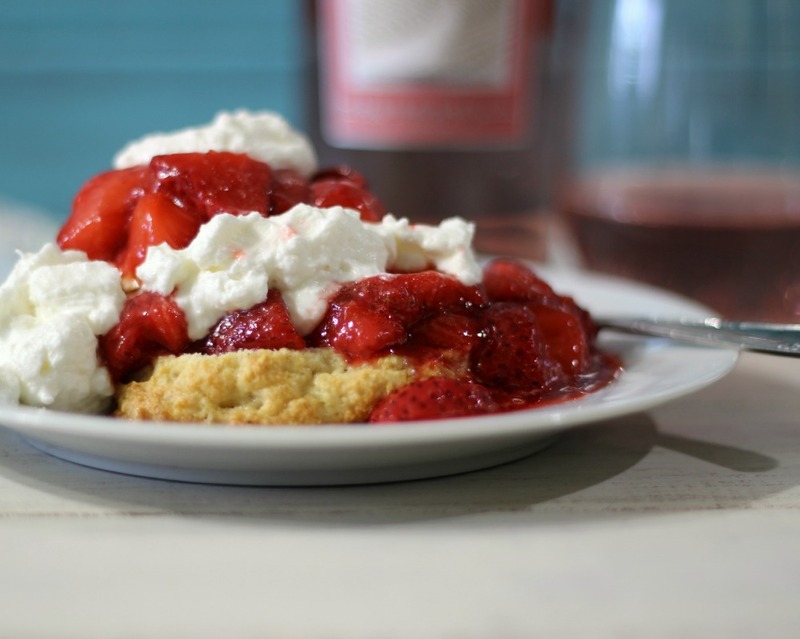 All I can say is after I made this recipe, my family and I couldn’t get enough of the strawberry shortcake. I did manage to have a little bit left so I could take it to work to test out with the true food critics. It was so good, that I was asked for the recipe. So this recipe may have been his idea, but I followed through with it and made it my own. See you can have fun in the kitchen without actually working with someone in the kitchen. You can cook with a good friend, family member and even co-workers via the phone, texting, one on one conversations outside of the kitchen. That’s what I love about cooking, sharing ideas and getting inspiration from each other. After all cooking, is just not filling your belly with food, but it is also sharing the love of food with others. Hmmmmm, I wonder if there are any recipes I inspired him to make? So next time you’re cooking or baking and are out of ideas, or not sure how to add zip to a soup, or what to make for dinner, contact a friend. I bet your friend will be more and happy to help you out, maybe even come over to help you cook it? Once you make your recipe, and your friend is not with you, take your meal to them to try. They will not only appreciate that you shared your recipe with them, but they will love that they participated in making it with you, even if they weren’t in the kitchen with you. I hope you have enjoyed today’s post as much as I did creating it. Now I am excited to brainstorm on more recipe ideas. I can’t wait to see what we come up with next.